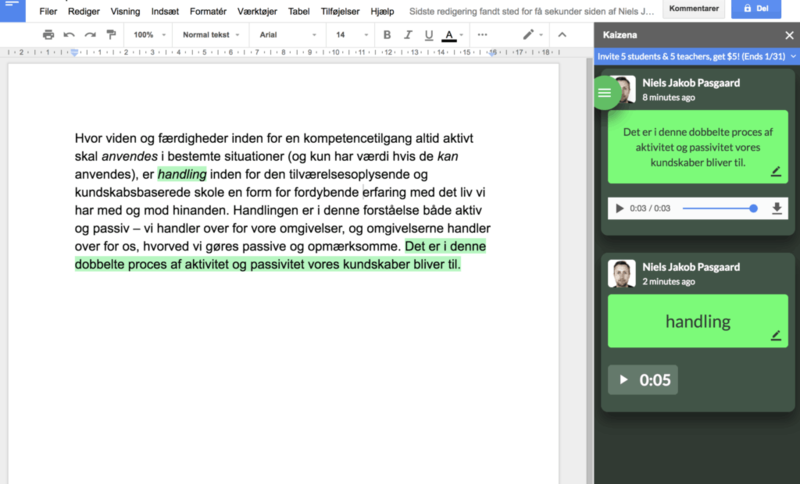 Kaizena is a free add-on to Google Drive, which makes it possible to record spoken comments. With Kaizena, you can select specific sentences in the students' written work, and record your comments as voice instead of writing them. Within the monological and dialogical form of teaching Kaizena can be used in conjunction with the guidance and tuition of students. Kaizena provides the opportunity for both spoken and written comments, and it is possible to answer to the comments in both writing and speak.. It can be an advantage for students, that there are several modalities to choose between when communicating with the teacher. Within a polyphonic form of teaching Kaizena can be used to support students' work on the development of a common text – it can be easier for some students to make their points clear, if they are given the opportunity to give them in speech, instead of having to type them. This way Kaizena can contribute to the differentiation between students with different prerequisites. Kaizena is not a new learning tool, but the integration with Google Drive has been absent for a couple of years. As a result of many of us having problematised this, it is now again possible to use Kaizena directly in Google Drive. All you have to do, is to install the necessary plugin in Google Drive, and log in with your Google account. If you need help getting started using Kaizena in teaching, there are guides online here.